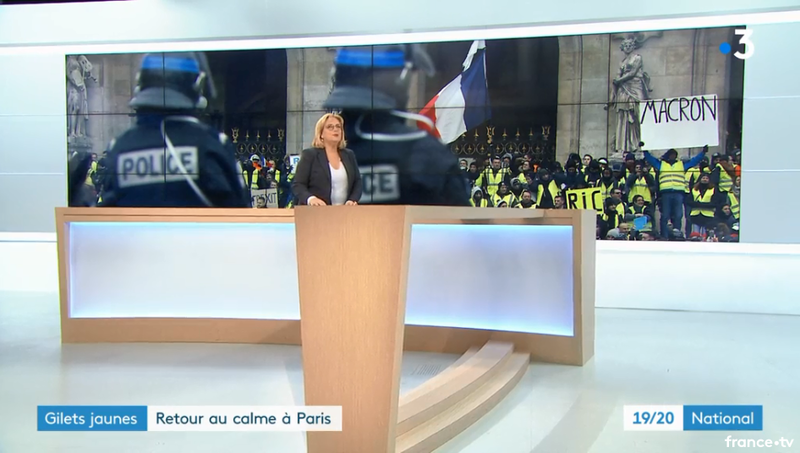 A French mainstream news channel, “France3”, has been caught doctoring signs held by Yellow Vest protestors, the original sign had “Macron Out” Written on it, the falsified sign had only “Macron” written. Notice the difference? 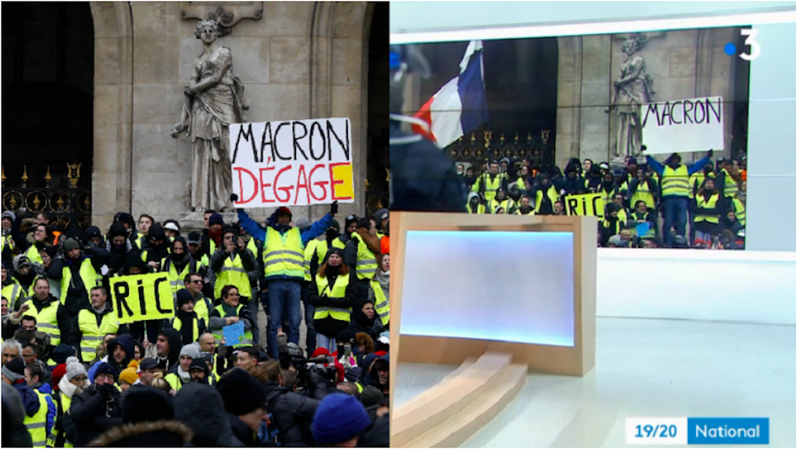 You can see the one on the left which in says MACRON DEGAGE, meaning Macron Resign, is now edited to only say MACRON when you see it in the news coverage on the right. Why would “France3” edit this photo before running it if the media was truly about reporting facts? How could “human error” erase a word from a sign in a photograph? This is a sad explanation to cover up something that has such a simple explanation. France3, like most other mainstream outlets, are trying to manipulate people’s perception. It should not take alternative media to provide the truth to people, but it does. 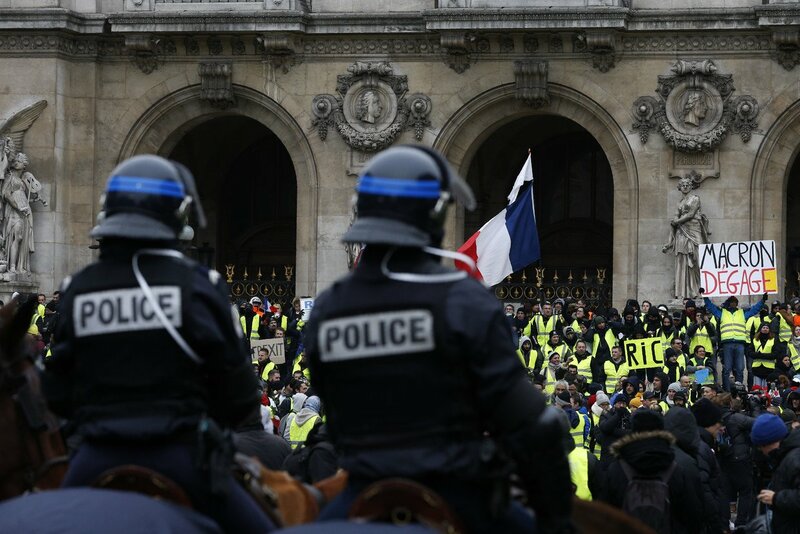 Another thing you won’t hear from western mainstream media outlets is that the majority of police in France agree with the Yellow Vests movement. Alexandre Langlois, the secretary-general of the VIGI police union. But there’s also alot of “corrupted” riot policemen who have been shooting very strong tear gas and flash-ball at protestors ( one student lost his eyes during recent yellow vests protests ) because of a flash-ball. These have been ignored by the mainstream media because the fact is most yellow vests protests are peacefull and they get violent because people are defending themselves against riot-policemen who are acting like Nazi SS, gassing and shooting at protestors till they get a violent reaction from them so that the mainstream media can claim that yellow vests protestors are “Violent people”. These policemen should be ashamed to obey such facist orders ! Because they should be protesting along yellow vests on the streets, becausethe people are protesting for the rights and liberty of every citizens of France. Change comes from shifts in consciousness within each individual, where we no longer see one another as enemies and separate, but as part of a whole and all affected by the same environment around us. One day, no human being will agree to go to war, kill another, or take orders to destroy. We are the tools used by the global elite, and we are people. Macron is a perfect example of that, clearly following the will of his masters -The bureaucrats in brussels, the Deep State.